We can make beautiful custom joinery for any project whether it is a new vanity, extra shelving, wardrobe, entertainment unit or bedroom furniture. Choose from the large selection of materials and finishes to create stylish individual pieces to suit any décor. Let us help you make your vision a reality using our modern manufacturing equipment and joinery expertise! An organized office space helps you to work more efficiently. Kitchen & Renovation Concepts can help you achieve a practical home office space by custom manufacturing office desks, stationery cabinets, filing cabinets, shelving, pin boards or white boards. Whether setting up a new office space or remodelling your existing space, let us show you the many options available. One popular piece of custom joinery is the TV or entertainment unit. This can be manufactured to perfectly fit into your home living space and accommodate your TV, devices, technology, and wires behind doors or in drawers. 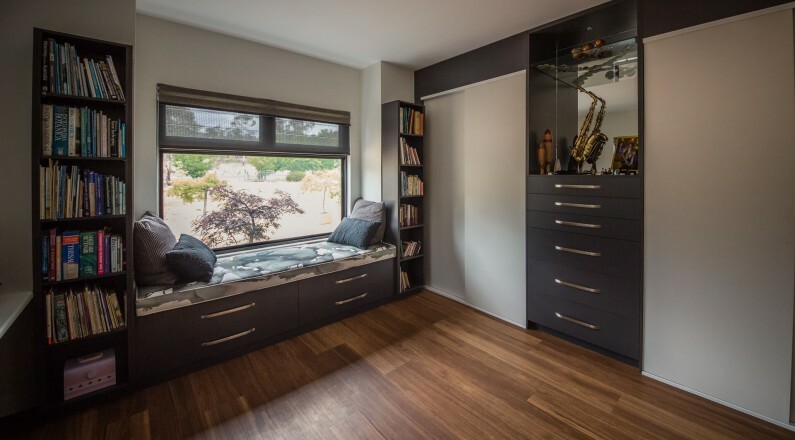 Whether you want a low line, corner or tall unit with glass or solid doors, this can be customised to suit your personal taste and style using the same great choice of materials and options available for all of our joinery. Need a display cabinet for your residential or commercial project? Discuss your requirements with one of our team and we can create what you need. Display cabinets can be made in many shapes and sizes including upright, corner or counter and can even create a cabinet to house your fish tank. You can choose a traditional or modern look using lots of glass. A mirror back and LED strip lights or downlights are the final touch and will ensure that your treasures or trophies are shown in the best way possible for everyone to admire. Custom daybeds can be manufactured from the same range of materials that are available for all your joinery projects. We can coordinate and organize custom upholstery as required with our suppliers. Custom daybeds are great in a bay window or can be a feature in a master or child’s bedroom where they can also offer an additional clever storage solution. A variety of mechanisms is available for the lift up component of the daybed, depending on your requirements. Custom fold out beds are manufactured by Kitchen & Renovation Concepts using hardware from several different suppliers, depending on style and design requirements. The custom finishes used can match any other joinery in your space. Fold up beds make a great addition to study nooks or office spaces, preserving the day to day functionality of these while giving more usable space for guests. Bespoke lighting features change the feel and presence in a room, particularly in commercial applications. It can also add ambience and highlight the beauty of materials or draw attention to interesting architectural features. Looking to store or display your wine? A custom wine rack is a perfect solution. These can be made in sizes and configurations to suit the space that you have and are, of course, available in the full range of colours and materials to create a contemporary or traditional look or to match your other joinery. They can also be built-in or freestanding. Bookshelves and custom shelving help to maximize storage space in your home and can be used in the living room, dining room or home office or anywhere you need a stylish storage option. Complement the look and design of your other pieces or furniture with a custom bookshelf or shelving or add functionality and extra storage space to your laundry, kitchen, or office with basic, custom designed units.